The Belgian striker has been allowed to return to home to be with his seriously ill father. Kilmarnock manager Kenny Shiels has confirmed striker Dieter Van Tornhout has been allowed to leave the club to return home. The forward, who scored the winning goal as the Ayrshire side beat Celtic 1-0 in the League Cup final, has gone back to Belgium to be with his father who is seriously ill.
Van Tornhout was absent as the team returned to pre-season training last month with the Rugby Park side allowing the player as much time as he needed to make a decision on his future. The 27-year-old, who came to Scotland after a spell in Cyprus, made 13 appearances for the club, netting one SPL goal against St Mirren in March. Confirming his departure, Kenny Shiels told national newspapers: “Dieter isn’t coming back to the club. “It’s a very sensitive situation. He wants to stay with his family in Belgium because his father has only been given a few weeks to live and he wants to be with them in the aftermath of that. 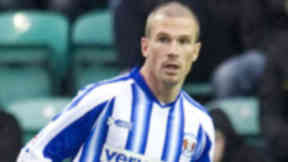 “He did well for us and has his place in Kilmarnock history after scoring in the League Cup final.